Since autumn 2015 London Health Emergency has been proud to have played a leading role in launching a new, wider, more active campaign -- Health Campaigns Together. HCT has proved its ability to lead and organise demonstrations, conference and campaigns. So after 35 years of separate activity, we want to thank all those who have continued to support us, but we will no longer be seeking separate affiliations or donations to LHE in 2019. Instead we urge LHE's remaining loyal supporters to affiliate and donate to HCT at www.healthcampaignstogether.com. NEW! Health Campaigns Together newspaper No. 14 - download now! 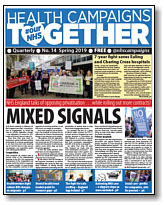 Issue 14 of our quarterly tabloid newspaper, 12 pages filled with news, analysis and comment, is available to download free NOW, with printed copies for campaigning available from April 4. Top stories include * Victory in North West London; * fighting PET scanner privatisation in Oxfordshire; * fighting RATIONING and CHARGES for NHS treatment; * updates to many campaigns; *social care; *mental health; and *the threat to scrap A&E and elective performance targets. Plus a column from Jonathan Ashworth MP, Labour's shadow Health Secretary. Every issue is FREE to read online. For campaigning, order bundles ONLINE NOW. 2018 – our third year – was a busy year for Health Campaigns Together. But all this and much more other work has drained our limited resources. To step up the effort further next year, and drive forward the campaign to Make Our NHS Safe For All, we need to raise more funds. So, in the season of gift-giving, we are appealing to all those organisations and individuals who support what we are doing to put Health Campaigns Together on your gift list this year. Please send us a donation, as large as you can afford, to help us achieve even more in 2019. Anyone donating who wishes to do so can join our regular mailing list and keep in touch with what we are doing. Anything you donate, either as a one-off donation or as a regular standing order, will go towards supporting the work of the campaign. It’s best for us if you can make direct payments online to our Coop Bank account, Sort Code 08-92-99, Account Number 65797921 but please email us at healthcampaignstogether@gmail.com to let us know how much you have paid. If you are unable to make payments online, cheques are very welcome. Please make out to Health Campaigns Together, and send to us c/o 102 Corve Street, Ludlow SY8 1EB. Well over 100 people from all over England took part in the successful Reclaim Social Care conference called by Health Campaigns Together in Birmingham on November 17, in collaboration with the Socialist Health Association, the National Pensioners Convention and others. 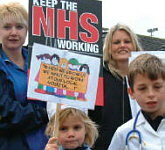 More pictures and reports, along with background facts and info on social care, are available HERE. 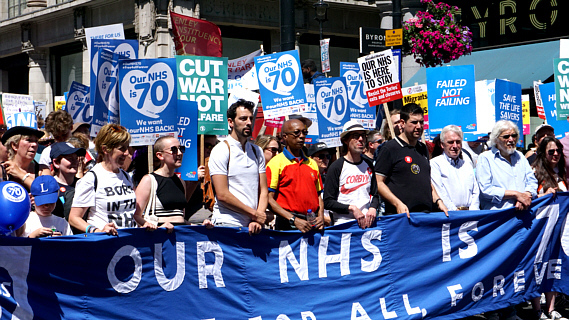 Click on the link here and then on the map or enter your town, city or postcode to find organisations near you fighting to defend OUR NHS. In 2010 David Cameron's coalition government discarded pre-election promises about the NHS. Instead they imposed savage spending cuts and pushed through 'reforms' which put at risk the health and lives of all of us. As a result the NHS is now in crisis. The NHS is efficient and affordable and didn't need radical reform. The private sector is not cheaper or more efficient than the public sector. The government is privatising the NHS. 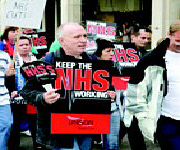 The NHS market is wasting billions of pounds while harming the service. A complete archived copy of the People's Inquiry into London's NHS website is now available here, including all submissions and background material. John Lister's book Health Policy Reform: Driving the Wrong Way, published in 2005, was hailed as "the definitive critique of market-oriented health care 'reforms' that the World Bank has been promoting at least since 1993". This latest work, Health Policy Reform: Global Health versus Private Profit is a completely revised and restructured analysis of health policy in which John Lister brings his critique of health policy up-to-date. He continues to question whether the major 'reforms' which have been, and are still being, introduced are driven primarily by the health needs of the wider population or, in fact, by nonhealth considerations - the financial and political concerns of governments and global institutions. 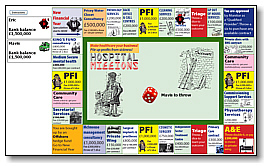 Play Hospital Millions on your computer, with up to four players. Experience the thrill of making a vast fortune at the expense of the elderly, sick and needy - or the exhiliration of trading while outrageously bankrupt, bailed out by government handouts! This game is still being developed, but we hope you will enjoy playing it. Make sure the sound is switched on. If you have any constructive comments please contact us. to assist health journalists, working journalists, journalism students, editors and publishers. Top up your specialist skills and knowledge! Download a leaflet here, explaining the EU-funded project that developed the resources. Please also tell us what you think of the material and any other issues you would like to see covered. or contact John Lister for details. 25 years on, read how campaigners in 1988 responded to cuts, privatisation and (pages 64-72) the even wilder plans of Oliver Letwin and others.